We were driving one day in Shrewsbury last year and had to go to Staples. We noticed construction, etc. next door and wondered what they were building in the old restaurant’s place. Then we saw a sign, “Trader Joe’s Coming Soon”. My husband became as giddy as a little boy who just won all the marbles. I remembered he mentioned Trader Joe’s in conversations. When he lived in out west he went there all the time. Unique, quality products. Fine frozen items. 2 buck Chuck. (the $2 table wine). Finally, it opened to grand fanfare. Dare I say? My husband was right. Love to take my time and peruse the aisles. (And I am a food store list shopper who likes to get in and out as quickly as possible.) Then, I stumbled upon one of the unique, tasty items. The mini rounds of brie, coutesy of “Trader Jacques”. So now, let me back go back to my past and explain why it appealed to me. At the holidays, I grew up with many tasty appetizers at holiday gatherings. 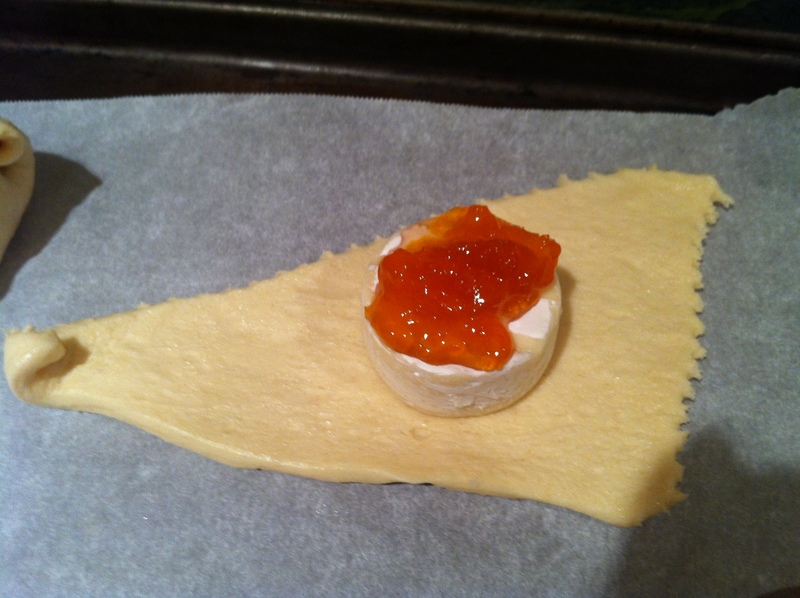 One of the classics and popular apps Aunt Sharon made was the big baked round of brie, with a thin layer of apricot or raspberry preserves on top, wrapped in dough. We all loved it but always savored a small decadent sliver at a time. Now suddenly I see a mini round of brie, a perfect 2-3 bite size portion? Yes, easy to serve with fruit and crackers but could I do something else? The wheels began turning…. 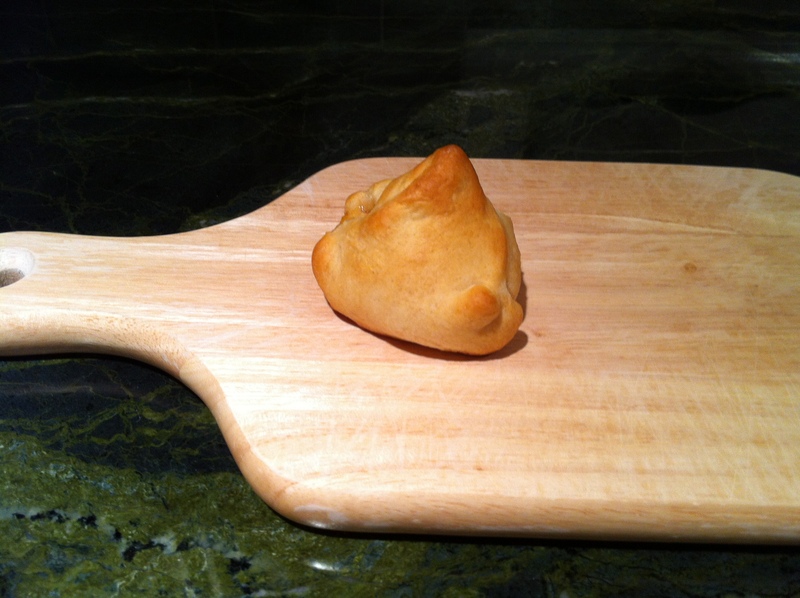 Take a mini brie, place it onto 1 or 2 crescent dough triangles. Slather your choice of preserves on top. Wrap it up and bake according to crescent dough instructions or until light golden brown. Did it work? Yes. 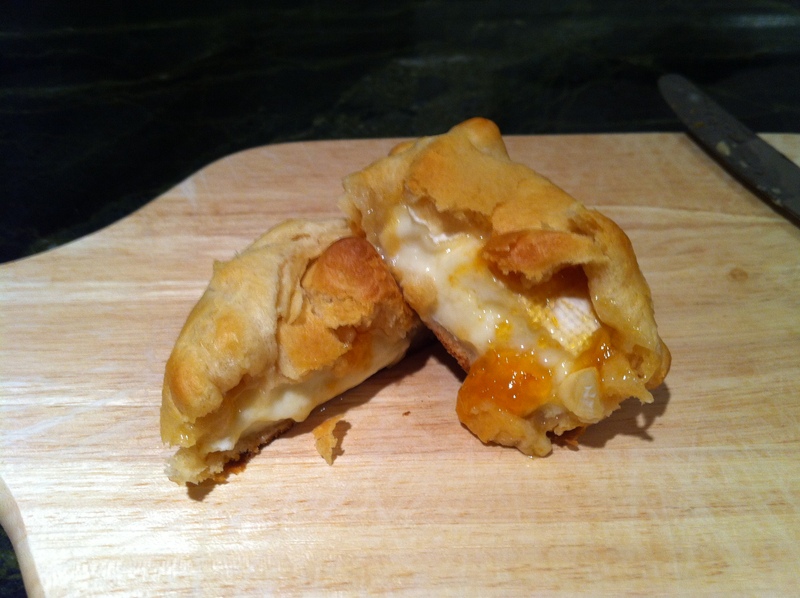 Though next time, I am going to try it with some store bought puff pastry for a different spin. Serve warm. Delish and easy. 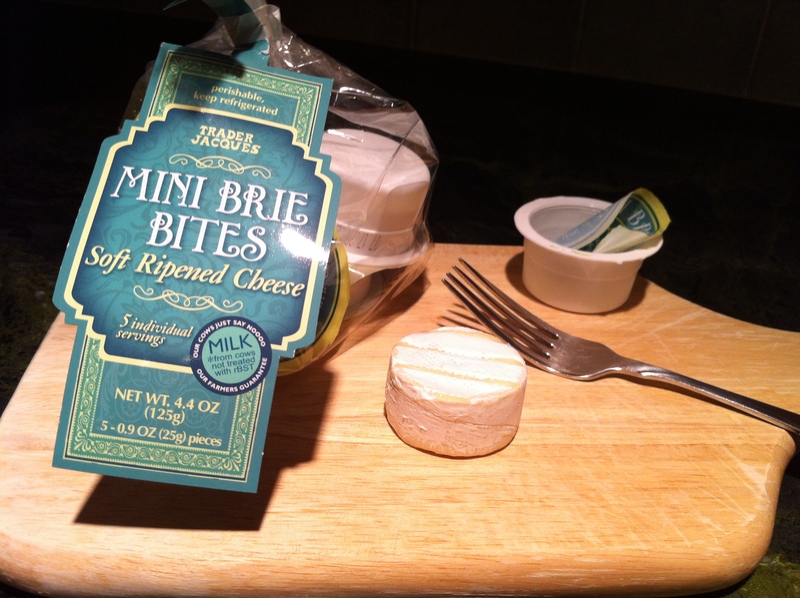 Thank you Trader Joe’s for the mini brie but we are still missing the $2 buck Chuck wine. Apparently, the state of NJ has limitations on alcohol sales so if we want $2 buck Chuck, we would have to drive to Westfield. Thanks for the kind words, Henry!